There is hardly a better symbol of the chaotic upheaval brought about by 20th century warfare in the far eastern reaches of Europe than Pidhirtsi Castle. The castle somehow survived the maelstrom of war and occupation intact. Amazingly, it still stands today, the same cannot be said of those who looted or retrofitted it for their needs. They are ghosts of a more recent and disturbing past. Pidhirtsi was also a cursed property for those political entities that had armed forces occupying it. Each of those entities, the Austro-Hungarian Empire, Russian Empire, Second Republic of Poland, Nazi Germany and Soviet Union all eventually ceased to exist. Their troops would come and go, finding Pidhirtsi as elusive to hold as the accursed region it was a part of. 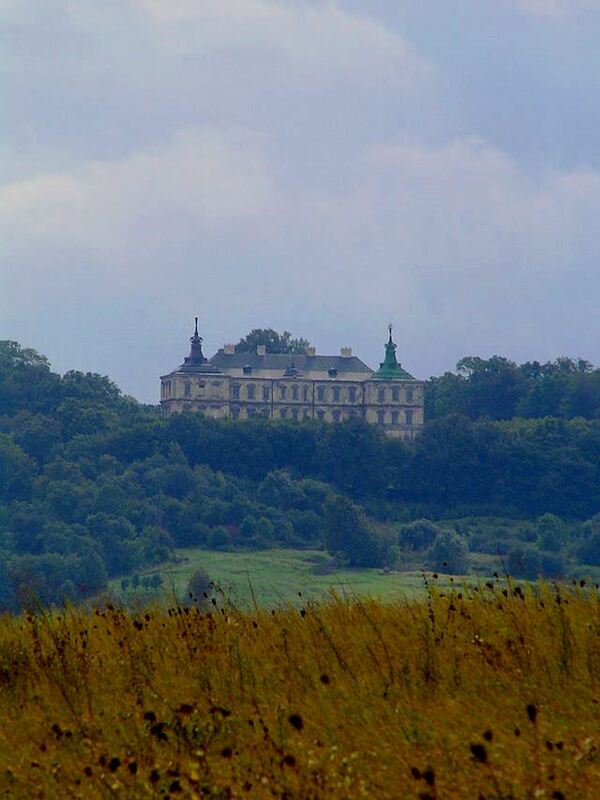 The castle now sits silent and austere in the Ukrainian countryside of Halychyna (Galicia), a contradiction within itself of crumbling grandeur. Partially restored, but still badly scarred, the castle has an otherworldly air about it. The fact that it survived decades of war and a three-week long fire is testament to both its usefulness and stout construction. Despite the abuses that the castle’s structure has suffered its greatness continues to endure. If ever a place looked like it was haunted, than Pidhirtsi Castle in western Ukraine would certainly be it. A gigantic architectural concoction of grandiose dilapidation, part castle, part fortress, its rustic, battered exterior looks like the kind of place conjured up by the most nightmarish of imaginings. Only a ghost would care to call this place home. Visitors to the castle are not disappointed as the castle is reputed to be haunted. As legend has it one of Pidhirtsi’s 18th century owners, Waclaw Rzewuski was driven to murder his wife due to insane jealousy. He was said to have had her walled up in the basement of the castle where she eventually died. As these stories often do, the legend has taken on a life of its own, with several variations. 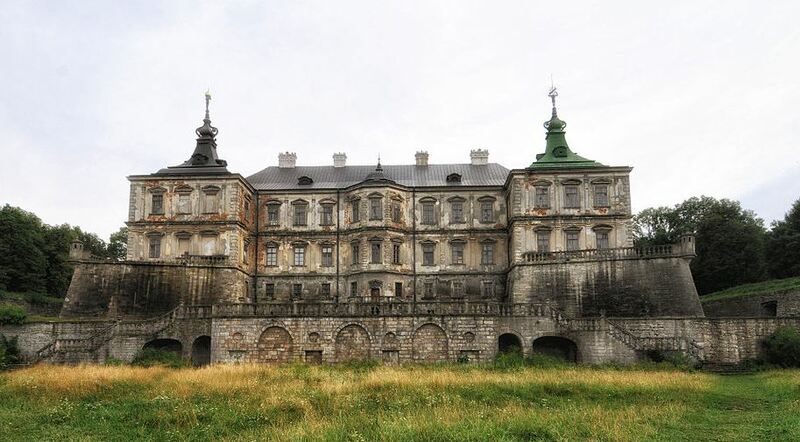 One has Rzewuski murdering his wife and then burying her body within the castle walls. Another says she was walled up because she was unable to bear Rzewuski any children. Even if such a murder did occur within the confines of Pidhirtsi it is doubtful the truth was really that colorful. Then again besides being a high ranking military leader and nobleman, Rzewuski was also a writer of drama, perhaps he did have something to do with the intertwining of legend and reality. The tale(s) spawned what has famously come to be known as the “Woman In White.” This shadowy apparition is supposedly seen haunting the halls of Pidhirtsi. A group of 20 Ukrainian psychics recently agreed that the place was filled with ghosts. Measurements of the electromagnetic field of the castle were off the charts, a pseudo-scientific sign for many that Pidhirtsi is most certainly haunted. The white woman has wide entertainment appeal. Shows such as the “Ukrainian Psychic Challenge” and “Ghost Hunters International” have filmed inside the castle. The story is also a lucrative sideshow for the tourism authorities allowing them to charge an extra fee for those wanting to visit the castle’s basement where the murder was said to have occurred. All of this is entertaining, but overlooks the true history of Pidhirtsi, a place where the past could best be described as a lavish nightmare instructive of mankind’s excess and depravity. Considering all that happened here and in the surrounding area from 1914 through the 1950’s the deeper past of Pidhirtsi takes on a whole new meaning. Pidhirtsi’s initial years could not have been more different from its later history. From the outset it was the scene of martial successes. Perhaps that is why a Latin inscription which says, “A crown of military labors is victory, victory is a triumph, triumph is rest” is inscribed on a plaque at the entrance gate. This quote was certainly true during the 17th and 18th centuries at Pidhirtsi for nearly everyone but its founder. The castle was more fortification than residence, the scene of triumphant military labors. It saw off multiple attacks by Cossacks, Tatars and Turks in the half century following its construction. The Polish Grand Crown Hetman Stanislaw Koniecpolski who commissioned the castle had originally envisioned Pidhirtsi as a place of rest. Its location meant otherwise. While the military victories must have been satisfying for Koniecpolski, the battles fought at or near Pidhirtsi were near constant. Koniecpolski seems to have had it all except his original vision for the castle and its surroundings. He owned entire districts, over 300 settlements, 18,000 households, a private army and commissioned the Koniecpolski Palace in Warsaw which today acts as the presidential palace of Poland. The only thing Koniecpolski did not have at Pidhirtsi was rest.. He never would. Koniecpolski was long dead by the time peace and quiet came to Pidhirtsi. In the years that followed, later owners would get to enjoy the fruits of his military labors. Only the ghosts of Koniecpolski’s greatness lived on through the castle he bequeathed to empires, nations and peoples he could scarcely have imagined. 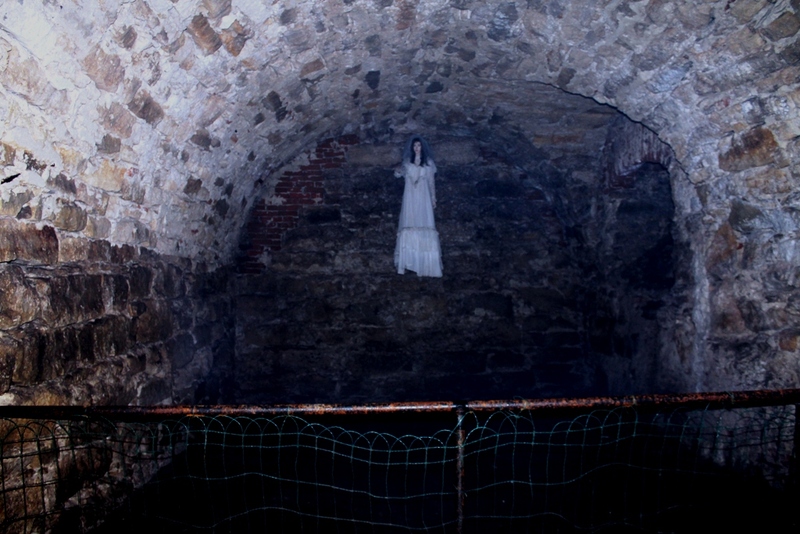 This entry was posted in Castles in Ukraine, Ukraine and tagged Galicia castles, Ghost Hunters International, Halychyna Castles, haunted pidhirtsi castle, Koniecpolski Palace, pidhirtsi castle, Stanislaw Koniecpolski, Ukrainian Psychic Challenge, Waclaw Rzewuski, white woman pidhirtsi castle, woman in white pidhirtsi castle by fortchoteau1. Bookmark the permalink.